China’s long-awaited blueprint for reform is epic, ambitious, detailed and vague. A sixty-point document issued by the ruling Communist Party on Nov. 15 covers everything from relaxing the hated one-child policy to opening up the financial sector and squeezing more dividends out of state-owned enterprises. It’s enough to restore investors’ faith, if not yet to help them allocate their assets. The ideological debut of party chief Xi Jinping, a year after he took office, offers a bit of something for almost everyone. Investors get a pledge to accelerate capital account liberalisation. For human rights watchers, there are vows to introduce more deliberative politics, abolish labour camps and be more sparing with the death penalty. Rural dwellers are promised more free migration and trading of land rights. Financially, previously flagged ideas should become reality. Private financial institutions will be allowed and deposit insurance may finally be introduced. Some service businesses will be opened up to foreign investment, while Shanghai’s new free trade zone may be copied elsewhere. Hong Kong, Macau and Taiwan are promised more love. And while state-owned enterprises are here to stay, the party hopes private capital can help them become more efficient. Still, investors have little to latch onto. Instead of firm targets or timetables, there are innumerable pledges to “deepen”, “strengthen”, “accelerate” and “perfect”. China’s politicians have stuck to their habit of not being drawn on the details. And critics can point out that many vested interests prevail. Rich urbanites in Beijing and Shanghai, for example, will be spared having to share their city lifestyles with hordes of peasants, who will be able to migrate freely, but only to small cities. The blueprint offers enough to fuel optimists. Xi Jinping has seemingly emerged from his first year with enough political capital to propose reforms his predecessors couldn’t. But there’s room for pessimists too, since the whole plan still smacks of gradualism, caution and centralised control. Marx, Leninism and Mao remain firmly entrenched in the party lexicon, which suggests reform is coming, but with Chinese characteristics. The big question is whether the contradictions that involves can hold for another decade. 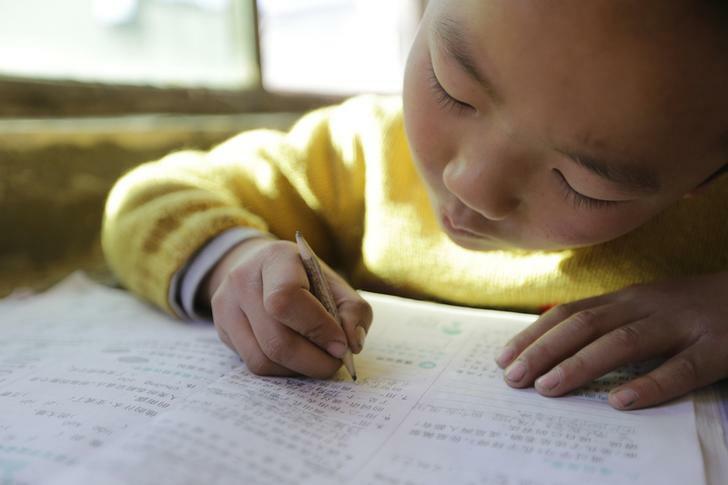 A student uses a pencil to write in class at Pengying School on the outskirts of Beijing November 11, 2013. China’s Communist Party released a long-awaited plan for future reforms on Nov. 15, three days after the end of the symbolic third plenary meeting of the ruling party’s central committee. The document, “Decision on several important questions relating to deepening reform”, includes a change to the one-child policy, pledges to relax foreign investment restrictions and changes that make it easier for rural dwellers to become urban citizens. Specific proposals include: increasing the dividends paid by state-owned enterprises to 30 percent of their earnings, and encouraging private enterprises to participate in reforming them; promotion of price reforms for water, oil, gas, electricity, transport and telecoms; fewer land requisitions; and the introduction of mechanisms for trading rural land. There is also a commitment to better property rights for farmers and easier migration in small and medium-sized towns, though population in large cities would remain controlled. The plan includes setting up more private banks and the introduction of a deposit guarantee system. Accelerated capital account convertibility would go with better access for foreign capital in finance, healthcare, culture and education and the opening of accounting, auditing, logistics and e-commerce businesses. Political commitments include the promotion of “deliberative democracy”, and the upholding the constitution, to ensure all are fairly treated. Social changes include addressing income inequality, and a more equitable social security system. The one-child policy would be relaxed to allow couples where one is an only child to have two children.